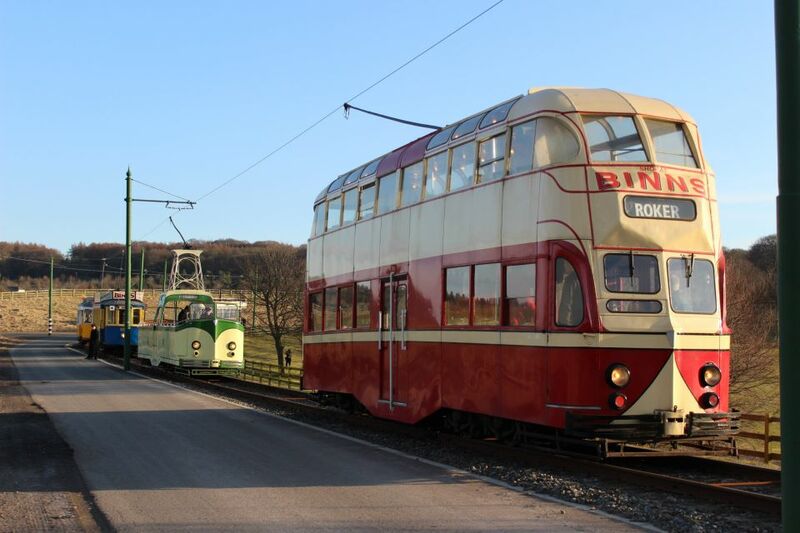 The highlight of the four-day ‘Our Friends Electric’ event at Beamish Museum took place on the evening of Saturday 6th April, in the shape of a cavalcade of tramcars through the Museum’s Town area. Earlier in the day, the tram service had kicked off with Glasgow 1068, making its passenger debut at the museum, and it was joined in service by Blackpool 31, Oporto 196 and Lisbon 730. 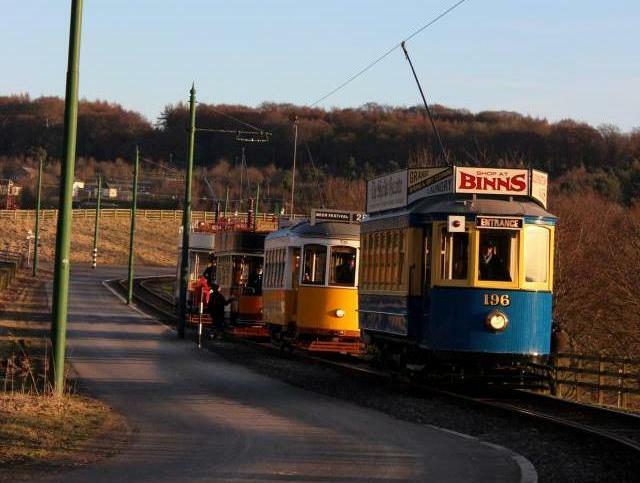 Notably this was the first time that a Scottish tram had ever ran in public service at Beamish, and also the first passenger working by a Crich tram at this museum. After a number of earlier setbacks, the tramway’s 40th anniversary event really hit its stride on this day, and this was mirrored by the weather which significantly improved, allowing all of the trams to bask in glorious sunshine throughout the day. Once again a good line-up of trams was arranged outside the depot, including Sunderland 16 which is currently unavailable for use due to severely worn tyre profiles. However, the highlight came at around 6:00pm, after most visitors had left the site, when a spectacular procession of all eight operational trams on site was formed on the edge of the Town area, close to the curve at Rowley Station. This was the first part of a special evening photo charter arranged for a strictly limited number of paying guests. All eight trams were lined up before being called forward and posed individually in the cobbled street, and then they all completed another circuit of the line, culminating in an incredible sight with them all lined up together in the street! Although darkness had fallen by the time of the grand finale this was truly an occasion to savour, and the presence of trams from the National Tramway Museum, the Merseyside Tramway Preservation Society and the Lancastrian Transport Trust certainly gave the event’s title real meaning. The procession was appropriately led by Newcastle 114, specially decorated with flowers and bunting as well as side boards proclaiming ‘forty years of service’ on its decency panels. Next up was Grimsby & Immingham 26, which of course inaugurated the tram service at Beamish in 1973, in its more familiar maroon Gateshead livery. Then it was Sunderland 101 and Blackpool 233, both owned by the Lancastrian Transport Trust, and the Portugese pairing of Oporto 196 and Lisbon 730. They were followed by Glasgow 1068 and bringing up the rear was Blackpool 31. 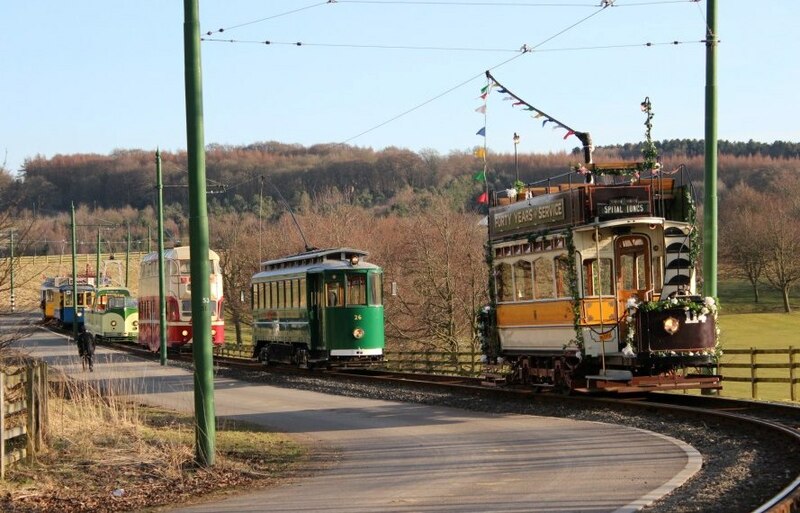 This was the biggest parade of trams ever seen at Beamish, beating the previous seven-car lineup achieved in 2011. Whilst the Beamish tramway event may not have quite lived up to admittedly high expectations, after a few hiccups the event certainly reached the level of greatness, particularly on the Saturday and with two unique visiting trams operating, visitors should certainly have gone home happy. However, there is still more to come, with the visiting cars expected to remain in service throughout the Great North Festival of Transport over the next two long weekends. They will be joined by a whole host of other attractions, including visits from replicas of two very early steam locomotives, Planet from the Manchester Museum of Science & Industry, and Rocket from the National Railway Museum at York. British Trams Online will be providing further coverage of this event including a small taste of the non-tram attractions, so stay tuned! The incredible parade of trams approaching Beamish Town on April 6th, with a tastefully decorated Newcastle 114 heading a row of trams stretching back as far as the eye can see! LTT owned Blackpool trams Balloon 703 (AKA Sunderland 101) and Boat 233 pose in the early evening sunshine on the Rowley curve, with Oporto 196 & Lisbon 730 waiting behind. Another Blackpool tram, Marton Box 31, is also visible in the distance as it joins the rear of the cavalcade. Blackpool Boat car 233 was escaping onto the main line for the first time during the event on this evening, and is seen here near to the fairground. 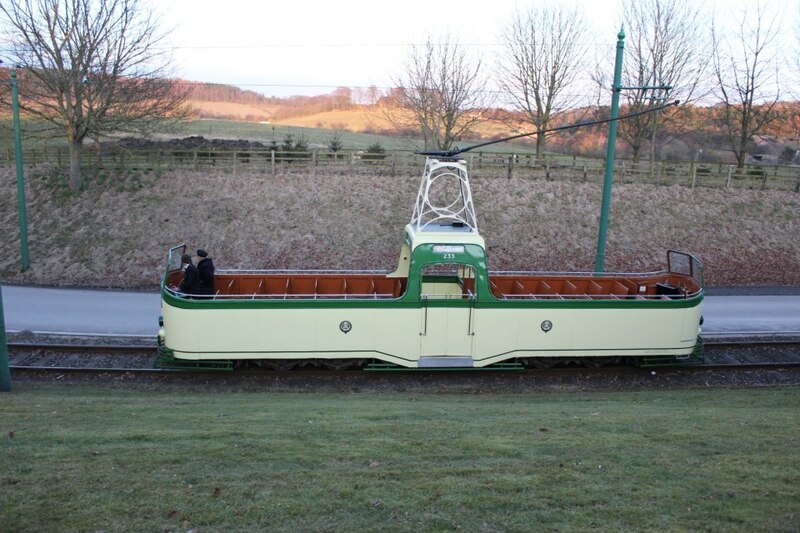 A year has now passed since this tram joined the operating fleet at Beamish, following a repaint funded by British Trams Online. Must also mention that there were supporting crews from Crich, Heaton Park and Birkenhead. Both Crich and Birkenhead along with the Beamish fitters have been happily working as a teamin commissioning 730 and 1068.